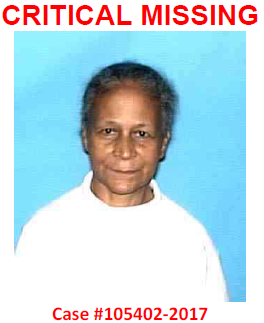 UPDATE: Ms. Restrepo has been located. Original Post: May 11, 2017 @ 1:04 pm. The Dallas Police Department is seeking the public’s assistance in locating the below critical missing person. On May 5, 2017 at about 10:30 a.m., Miriam Restrepo was last seen in the 5400 block of Lidnsley Avenue Dallas, TX. Ms. Restrepo is a 71 year old White female, she is about 5’03” weighs 130 lbs., has brown eyes with curly, salt and pepper hair. She was last seen wearing a pink shirt with gray pants and black Nike shoes. Anyone with information regarding the whereabouts of Ms. Restrepo, please contact the Dallas Police Department at 9-1-1 or 214-671-4268.